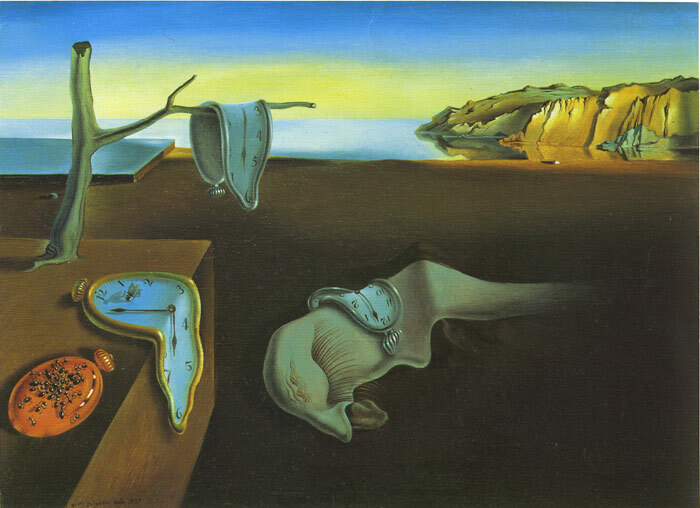 Those limp watches of Dali are as soft as overripe cheese—indeed "the camembert of time," in Dali's phrase. Here time must lose all meaning. Permanence goes with it: ants, a common theme in Dali's work, represent decay, particularly when they attack a gold watch, and become grotesquely organic. The monstrous fleshy creature draped across the painting's center is at once alien and familiar: an approximation of Dali's own face in profile, its long eyelashes seem disturbingly insectlike or even sexual, as does what may or may not be a tongue oozing from its nose like a fat snail. The year before The Persistence of Memory was painted, Dali formulated his "paranoiac-critical method," cultivating self-induced psychotic hallucinations in order to create art. "The difference between a madman and me," he said, "is that I am not mad." SPECIAL NOTE : The painter will make the reproduction as close to the original oil painting as possible. If you want your painting to alter from this likeness, please email us and " The Persistence of Memory " will be reproduced according to your special requirements.